It is a new year, and I am making a resolution to have at least one post per week. I got overzealous when I first started this, probably because it was summer, and work slows down. Once life caught up to me, something that I began as a mind break, something without any accountability, deadlines, and so on, became a chore and I became less and less likely to post. As I reevaluate, I think one post a week is reasonable, and if I manage to squeeze in more than one, YAY ME! 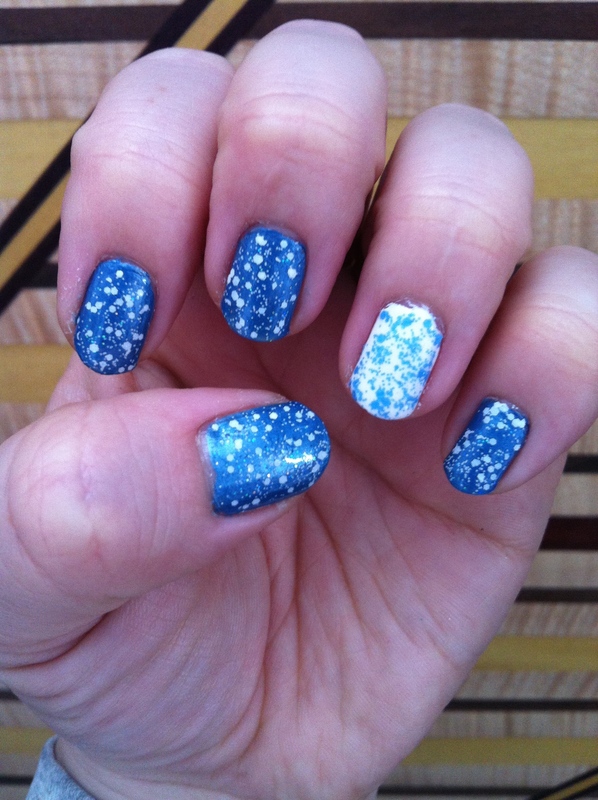 Also, I have been following some nail art geniuses! I love your work, and I get such a kick seeing it! But I am just the everyday, have some nail polish stuff, like to try it out, girl. I am not going to have freakishly awesome nails. I am going to have nails that I like, and I think are doable for anyone. When I read back through what I had posted, there were tons of “excuse the messy edges” or “I know it’s not perfect” or “I know my toes are yucky”…I could go on. Part of my resolution is just to be me. Stop making excuses for being me. No, my edges aren’t always cleaned up, because I snap the pics right away, before I do projects with kids, dishes, or whatever else boogers them up. And my pics aren’t going to be perfect because I am not a photographer. And honestly, who has beautiful toes? So if I want to show my pedi, I will. Take it for what it is. In my effort to make one post a week, I will feature things like my nails, my supplies, my storage, whatever I think would appeal. My nail collection is not always the latest and greatest (if you follow me, you know I am about the clearance) but I think there are lots of people, in this economy that cruise the clearance, find cute polish and use them. Basically, I am the average working woman on a budget. I want to do this blog for me, as a release, as a fun thing. 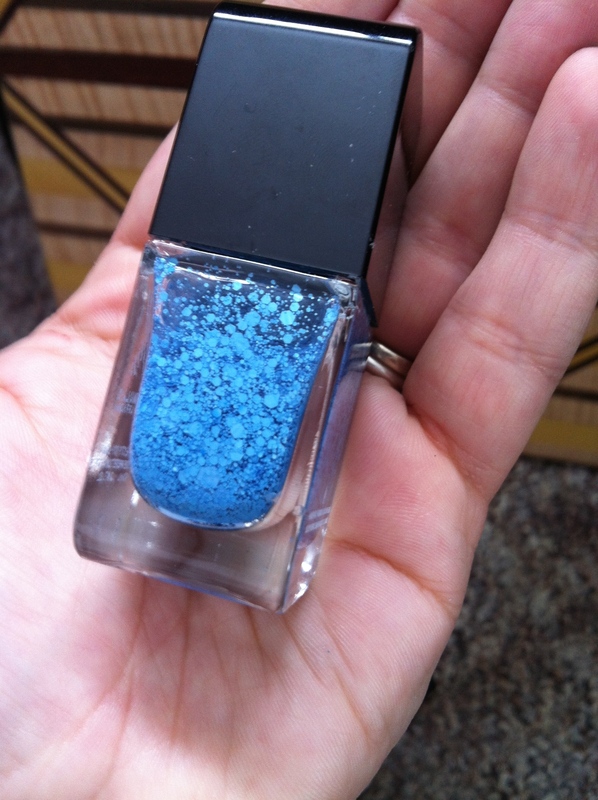 The OPI polish is a beautiful blue with a silver metallic touch and blue glitter hints in it. Somehow, the elements that I thought would make it more intense, seemed to calm it down. Weird, right? I used the OPI on all of my fingers, except for the ring finger, and I used the Xtreme Wear on it. Then came the toppers. On my ring finger I used the Sephora polish. (I scored that a TJ MAXX for $1.25!) 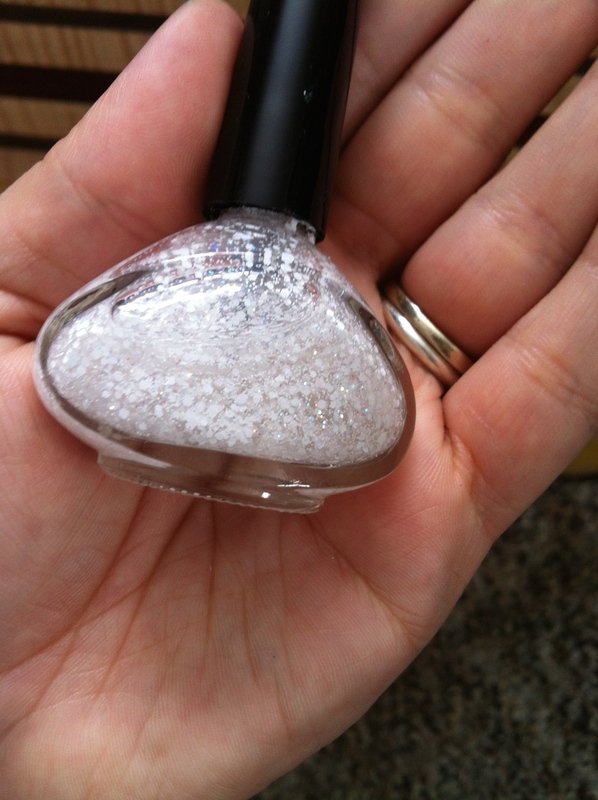 I really like it because it has all different sizes of these pearly glitters and goes on really nicely. It wasn’t that glitter struggle of tapping, daubing, smearing, trying to spread it relatively easily. 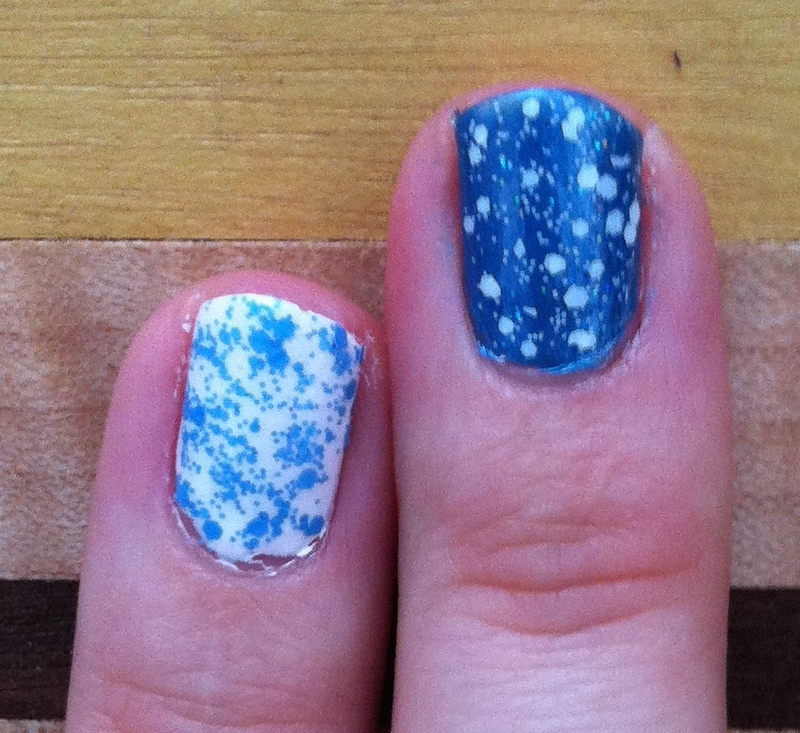 For the topper on all of the blue fingers, I used the Funky Fingers. 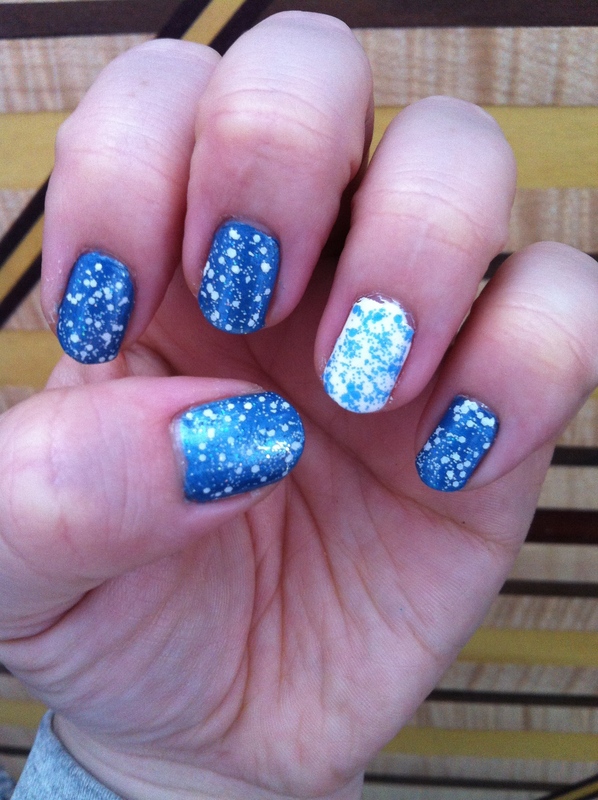 There are actually snowflakes in that polish, but I wasn’t able to get any out. I also had to add a couple drops of thinner to the mix, because while I love all the sizes of matte and iridescent glitters, it made it too tough to get out and spread. Once I thinned it, it was much easier. I think that the blues and whites worked well together, and help to make a sort of wintry feel.